The ordinance regulates fertilizer management practices and sets rules for the proper application and use of fertilizers. All agriculture and silviculture activities are NOT regulated under this Ordinance. Fertilizer application guidelines allow no more than 5 lbs of nitrogen per 1,000 square feet, per year, and less in some cases depending on type of grass. 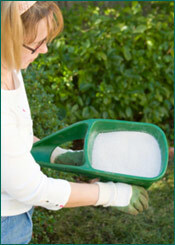 The State requires all fertilizer sold in Florida to be labeled consistent with this rule. Fertilizers shall not be applied if there is a flood, tropical storm or a hurricane watch or warning issued by the National Weather Service for St. Johns County, or if heavy rain is likely. Fertilizer shall not be applied within ten (10) feet, or three (3) feet if a deflector shield or drop spreader is used, of any surface water body. All commercial and institutional applicators of Fertilizer within St. Johns County shall abide by and successfully complete the six-hour training program in the “Florida Friendly Best Management Practices for Protection of Water Resources by the Green Industries” (2008). All fertilizer businesses must ensure that at least one employee has an appropriate “Florida Friendly Best Management Practices for Protection of Water Resources by the Green Industries” (2008), as amended,training certificate prior to the business owner obtaining a Local Business Tax Certificate. The ordinance applies to anyone both personal and professional. And it provides exemptions for agriculture, golf courses, and specialized turf. The ordinance does not apply to farms, pastures, golf courses, and other specialized turf areas already under appropriate best management practices. Training for landscapers will be provided through the University of Florida St. Johns County Extension Service. University of Florida St. Johns County Extension Service. Classes on Green Industry Best Management Practices.